This is CME on ReachMD. This activity, Moving Toward a New Standard of Care: Checkpoint Inhibitors in Advanced Urothelial Cancer, is jointly sponsored by the University of Cincinnati and CORE Medical Education, LLC, and supported by an educational grant from Merck & Company, Inc., and AstraZeneca. Before beginning this activity, please go to ReachMD.com/CME to review the disclosures, learning objectives, and accreditation statement, as well as an online toolkit supplement available to clinicians to download. Your host is Dr. John Russell and he is joined by Dr. Arjun V. Balar, Associate Professor of Medicine and the Director of the Genitourinary Medical Oncology Program at the Laura and Isaac Perlmutter Cancer Center at New York University Langone Medical Center in New York, New York. 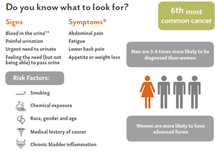 Urothelial cancer of the bladder, renal pelvis and other urinary organs is the fifth most common cancer in the United States. While systemic platinum-based chemotherapy remains the standard of care for first-line treatment in advanced and metastatic urothelial carcinoma, the introduction of novel immunotherapy agents has led to rapid changes in the field, particularly for those patients who can’t receive chemotherapy. This is CME on ReachMD, and I’m Dr. John Russell. Joining me today is Dr. Arjun V. Balar. Dr. Balar, welcome to our program. So, starting with an overview of urothelial cancer, what’s the incidence rate in the United States, and what’s the typical population that’s diagnosed with these types of cancers? That’s a great question. About 81,000 or so patients every year will be diagnosed. In fact, that’s how much we are expecting in 2018. And there will be about 17,000 disease-related deaths. This is a disease of older individuals, affecting mostly men, usually in their 70s. Tobacco use is the primary cause of this disease. About 80% of patients will be either current or former smokers. And our treatment approaches for metastatic bladder cancer, up until most recently with the advent of immunotherapy drugs, has largely been palliative chemotherapy. There are studies dating back several years looking at single-agent chemotherapy drugs and then ultimately combination, which have ultimately culminated in cisplatin-based chemotherapy as our first-line standard of care—and in fact, actually, in the first-line setting the only agent that’s shown a survival benefit. We know also that a small proportion of our patients, maybe about 10%, are actually cured with cisplatin-based chemotherapy, but it is associated with a great deal of side effects and toxicity. Irrespective of the first-line standard of care, whether a patient receives cisplatin-based chemotherapy or the alternative, which is carboplatin-based therapy, if patients progress on that, the outcomes in the second-line setting and beyond unfortunately are very, very poor, with a median survival of 6 to 8 months, and this is a context in which novel agents were developed including, most importantly, novel immunotherapy drugs. So, prior to these novel immunotherapy agents, you mentioned cisplatin. What were some of the other medications you were using? Cisplatin-based chemotherapy with additional agents, such as gemcitabine, or cisplatin as part of the MVAC regimen, which is methotrexate, vinblastine, Adriamycin and cisplatin, is the standard of care, but for patients who cannot tolerate cisplatin, which is easily about 50% of patients, we most commonly use carboplatin-based therapy, and carboplatin most commonly combined with gemcitabine was the other alternative standard of care. Some patients, unfortunately, are not even candidates for that, and they will sometimes receive single-agent chemotherapy with either a taxane or gemcitabine alone if they are not good candidates for any -platin. So you mentioned immunotherapy. In general, how does immunotherapy work in the realm of cancer? In cancer, immunotherapy is a very broad term. Essentially, it’s therapy that focuses on targeting the immune system as a cancer therapeutic. Now, if we rewind 30, 40 years ago, there were cytokine-based therapies, such as high-dose IL-2 or interferon, and these cytokine-based therapies broadly stimulated the immune system. Now, fast forward to the last decade, the agents that we have in clinical trials and currently FDA-approved for a variety of indications are these molecules called checkpoint inhibitors, and essentially what they do is block negative regulators that are present in the immune system such that they enhance T-cell priming, which is largely where CTLA-4 antibodies work, and then also enhance effector T-cell function, which is largely where PD-1 and PD-L1 antibodies work. When we combine these 2 together is often when we see synergy where we see enhanced responses, and in particular where we’ve seen that is melanoma. Bladder cancer is one of these immunogenic tumors, because one of the questions we naturally ask is: How is it that bladder cancer is responsive to these agents, whereas other cancers are not? And one of the issues that we’ve realized about bladder cancer is that tumors just like bladder cancer that are related to environmental or tobacco carcinogen exposure, they often have many mutations. In fact, bladder cancer is similar to lung cancer in that regard, and then also melanoma, in which case we’re talking about the sun as a carcinogen. Tumors that are driven by carcinogens tend to have many more mutations, and those mutations lead to new antigens, which are recognized as foreign by the host immune system and then allow for immunotherapy to work. So you mentioned checkpoint inhibitors. So, how do they stimulate the immune system to fight cancer? So, specifically what happens—and let’s focus a little bit on PD-1 pathways—so what happens is that immune cells that are infiltrating the tumor or the tumor cells themselves will express a ligand called PD-L1, and this ligand is designed to activate the PD-1 receptor that is present on effector T-cells. Now, effector T-cells are the cells that are responsible for actually generating and actually attacking cancer cells, but when this PD-L1 ligand is attached to the PD-1 receptor, it actually turns off the T-cells and allows the cancer cell to evade the immune system. These antibodies or checkpoint inhibitors specifically target either the PD-1 receptor or its ligand and then prevent that interaction. The T-cells wake back up and then exert their antitumor immune response. So, how do you decide to use these checkpoint inhibitors? How do you individualize and use appropriate indications for deciding which patients to use these medications on? Right. So to answer this question, we obviously have to look at the totality of the data, and what we know is that in the second-line setting, 5 different agents have been approved by the FDA, 4 of which have received accelerated approval, and the fifth has received full approval, and this is on the basis of response, duration of response, survival, as well as safety across these 5 agents. And these agents are atezolizumab, nivolumab, durvalumab, avelumab and pembrolizumab, and each one of these monoclonal antibodies either target the PD-1 receptor or PD-L1 ligand and have demonstrated response rates in the range of 15 to 21% in the second-line setting and actually have very comparable safety profiles across the agents. Since the response rates are very similar and the safety is very similar, most of these drugs are essentially interchangeable in the second-line setting, and the choice of which agent to use is largely driven based on formulary, cost of the dose and the schedule of treatment. Some patients prefer every 2 weeks dosing, other agents have the flexibility of every 4 weeks dosing, and so that’s how we choose these agents. This is obviously based on the data, as I mentioned. So the first study that tested checkpoint blockade was IMvigor 210, which was a phase II 2-cohort study that focused on advanced bladder cancer patients who were treated with atezolizumab in this particular trial. Cohort 2, which was the primary focus of the study, enrolled 310 patients who had previously progressed on platinum-based chemotherapy. And what we know from the initial data that was presented and ultimately published in The Lancet in 2016 was that we observed a response rate of approximately 16% and then a median survival of 7.9 months. But it’s not the survival that’s important. It’s actually the responses. So, historically, these patients would typically receive single-agent chemotherapy with taxane, which have response rates of roughly 10%. So 16% is certainly not eye-popping, but what is noticeable is that there is durability of the responses, and this was demonstrated in the update that was presented at ASCO in 2016 showing ongoing responses with a median duration of response not yet having been reached in the patients who did achieve a response, and this one actually had a median follow-up of 17.5 months. And this level of activity for any agent in bladder cancer has really not been seen before, and so really, it has to do with the duration of response that is quite striking, and that is something that’s only feasible with immunotherapy, and we really don’t see it with chemotherapy drugs. So I wanted to complete reviewing some of the data that supported these approvals. KEYNOTE-45 was the randomized phase III trial which tested pembrolizumab versus one of three short chemotherapy in the second-line setting, a trial that was similar in patient eligibility as IMvigor 210 cohort 2, and in that particular trial patients were randomized to pembrolizumab versus taxane or vinflunine chemotherapy, which is only available in the European Union, and that showed a survival benefit for immunotherapy in the second-line setting compared to standard chemotherapy. And moreover, with longer-term follow-up of nearly 28 months, the hazard ratio had improved from 0.73 at the initial analysis now down to 0.70, showing again that with even longer-term follow-up, the difference between outcomes in patients treated with immunotherapy versus chemotherapy is actually quite striking. The additional data that supports other agents includes Study 1108. This is the study that tested durvalumab also in a second-line setting as part of a phase I trial. Patients were treated with durvalumab 10 mg/kg every 2 weeks for up to 1 year. The eligible patients were those with advanced bladder cancer who had progressed on prior platinum-based chemotherapy. And what this study showed at the most recent analysis presented at the ASCO Annual Meeting 2017 was a response rate of 17.8% in the 191 patients who were enrolled into this trial. In total, what we see again is that across these individual agents, we see response rates in the range of 15 to 21% and similar durability of responses as well as safety, and all of these agents again are supported by these data for their use in the second-line setting. For those just tuning in, this is CME on ReachMD. 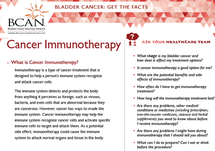 I’m Dr. John Russell, and today I’m speaking with Dr. Arjun Balar about immunotherapy in urothelial cancer. So, turning to PD-L1 testing, what is its role in treating urothelial cancers in patients with checkpoint inhibitors? Is there a difference whether the indication would be a first-line or second-line indication? So that’s a very, very important question and something that’s a little bit in flux right now based on the available data, and I’ll touch on the second part which is: Is there a difference whether the indication is first- or second-line? And so, to first answer that question, it’s probably important to review the first-line data that supports the use of checkpoint inhibitors in this disease. I’ve already reviewed the second-line data. In first-line there is less data that’s available, but we have information from 2 first-line phase II trials that support accelerated approval of these agents in the first-line setting. The first one that I will cover is atezolizumab as part of the IMvigor 210 study. Remember, earlier I had mentioned that the 210 study had 2 cohorts. Cohort 2 was the platinum pretreated cohort, which was the primary focus of the trial. The other cohort, which was cohort 1, focused on 119 patients who were in the first-line setting who had never been treated for advanced bladder cancer but were considered ineligible for cisplatin-based chemotherapy. Remember, these are the patients who have the worst outcomes because they’re not eligible for survival-prolonging treatment with cisplatin. And in this particular study, what we observed is that the response rate was 23% with a complete response rate of 9% of the initial analysis that was presented and a median survival of 15.9 months with a 1-year landmark survival rate of 57%. When we compare this with historical data for gemcitabine and carboplatin, which is the otherwise alternative that we would use in this patient population, it compares favorably considering the survival for this group is roughly 9 months with very few durable long-term survivors. There was an update to this analysis that was presented at the ASCO 2018 annual meeting showing that now the median survival is just over 16 months, and the proportion of patients that are alive at 2 years is 41%, which is quite striking when compared to patients who would otherwise have been treated with carboplatin-based therapy. The response rates from the liver, unfortunately, are still low. What we know across trials is that checkpoint inhibitors do not work so well in visceral metastases, and in particular, liver metastases, and so for these patients alternative regimens are a consideration, and sometimes chemotherapy as well. In KEYNOTE-52, this was the second study that supported approval of immunotherapy in the first-line setting, and it tested pembrolizumab. It was very similar in trial design to the IMvigor 210 Cohort 1 study in terms of the patient eligibility—cisplatin-ineligible patients who had never received treatment in the metastatic setting. However, it was a much larger trial and aimed to enroll 350 patients. The data that was most recently presented in terms of updated efficacy from ASCO 2017 showed a response rate of 29%, which actually was an increase from the initial analysis that showed a response rate of 24%, showing that with longer-term follow-up and continued treatment that the response rates can increase. This is something that’s really only possible with immunotherapy, not so possible with chemotherapy. So, at ASCO 2018, we also presented a long-term follow-up from the KEYNOTE-52 pembrolizumab first-line study, and what we see is now with the median follow-up of 11.5 months, the median survival is 11.5 months. And since this was a well-powered study of enrolling 370 patients, we did have the opportunity to look at survival based on PD-L1 status, and what we see from this follow-up is that for patients who had higher levels of PD-L1 expression as measured as combined positive score of 10% or greater, that the median survival was 18.5 months, which is quite remarkable considering that in the first-line setting, the median survival even with our best chemotherapeutic options are in the range of 12 to 15 months, suggesting that patients in the first-line setting who have high levels of PD-L1 expression are those who are destined to have the most benefit from first-line immunotherapy. And so these are the data that support the use of front-line immune checkpoint inhibitors, so the question is: What is the difference between first- and second-line, and how does PD-L1 testing have a role? And essentially, the answer comes from a safety alert that was issued by the FDA in middle of May showing that in a separate study where both pembrolizumab and atezolizumab were being separately studied as part of 2 randomized phase III trials showing that patients treated with either pembrolizumab or atezolizumab monotherapy but for patients who had low levels of PD-L1 expression, that they had worst survival compared to patients who were treating with chemotherapy. And it’s important to note that in these 2 studies, which is IMvigor 130 and in KEYNOTE-361, testing atezolizumab and pembrolizumab respectively, that all of these patients that were enrolled in these trials were eligible for platinum chemotherapy, which includes carboplatin or cisplatin. And because this worse survival was noticed, there was an update to the prescriber label in July 2018 for both pembrolizumab and atezolizumab saying that for the first-line setting, that patients who have high levels of PD-L1 expression using an FDA-approved test would be eligible for first-line immunotherapy with either pembrolizumab or atezolizumab. Those patients who have low levels of PD-L1 expression tend to not respond as well to first-line immunotherapy and should be, rather, considered for chemotherapy as an alternative. What is interesting about the update to the prescriber label is that it preserved the access for patients who are not eligible for any form of chemotherapy to still receive immunotherapy since that is truly often their only viable treatment option. In the second-line setting, however, it is quite definitive that immunotherapy is better than standard of care chemotherapy, irrespective of PD-L1 status, so this is based on the randomized data from KEYNOTE-45, where the purposes of PD-L1 testing—there’s very little role for PD-L1 testing in the second-line setting, but there clearly is a role in the first-line setting when patients may have otherwise had access to platinum-based chemotherapy, either with cisplatin or carboplatin. So, doctor, what are some of the novel treatments or combinations under investigation for urothelial cancer? I think one of the important things that we’ve realized over the last 3 or 4 years is that while checkpoint inhibitors are probably the most important advancements in over 30 years of research in this disease and we have 2 agents that are approved in the first-line setting, that we know that only a minority really respond, and so we need to focus on novel combinations. Those other novel combinations have to be rationally based, and we must target either other redundant pathways or other pathways to enhance immune responsiveness, and these include other checkpoint inhibitors, chemotherapy, radiation, antiangiogenic therapy or targeted therapy. There are many agents that are currently in development, so it’s impossible to cover an exhaustive list. What we have discussed here today is CTLA-4 blockade in combination with PD-1 inhibitors. This was tested as part of the BMS’ S program looking at nivolumab plus ipilimumab showing in a phase I study a response rate of 38% in platinum-refractory advanced urothelial cancer for patients treated with nivolumab 1 mg/kg plus ipilimumab 3 mg/kg. The study here was enrolling only 26 patients as part of a multi-arm phase I trial, so this is early data in a small subset, but this is worthy of further study. Another agent that is being tested is tremelimumab, which is also a CTLA-4 antibody, in combination with durvalumab, which is a PD-L1 antibody, and is part of also another phase I study. This was tested in combination in platinum refractory urothelial cancer showing a response rate of 20.8%. What is noteworthy about this particular study is that the PD-L1 negative population in this study had a response rate of 15%. When we look at the original Study 1108, which supported durvalumab monotherapy, the response rate was 5% for patients who had low levels of PD-L1 expression, suggesting that the combination of tremelimumab may enhance responses in particular for patients who have low levels of PD-L1 expression, and maybe this group of patients warrants the added toxicity potentially present with the additional CTLA-4 blockade because maybe we can enhance responses. Nonetheless, these are phase I data, so they need to be tested in a randomized setting. There are 2 important ongoing phase III trials, the DANUBE study, which is testing durvalumab with or without tremelimumab versus platinum-based chemotherapy, and CheckMate 901, which is testing nivolumab plus ipilimumab versus platinum chemotherapy in advanced bladder cancer, both in the first-line setting, and we should anticipate data from these trials within the next couple of years. Important other combinations that are important to consider are chemotherapy-based combinations. There are 2 randomized, large phase III trials that are currently ongoing, IMvigor 130 and KEYNOTE-361, which are testing platinum chemotherapy plus immune checkpoint inhibitor blockade with either PD-1 or PD-L1. What we know from a similar designed study in first-line non-small cell lung cancer, KEYNOTE-189, is that we observed improved outcomes with the addition of platinum chemotherapy plus immunotherapy, and that is now the new standard of care in advanced lung cancer. Many of us in the field expect that we should see similar outcomes with platinum chemotherapy and immune therapy in advanced bladder cancer as well considering the similarities that exist between these 2 diseases. So, Dr. Balar, you’re in a New York City teaching hospital. Is this the expectation that someone could get for urothelial cancer anywhere across the United States? Yes, absolutely. So the standards of care that I have described here are standards coast to coast and are FDA-approved agents, and all patients should have access to these novel therapies no matter where they are; but what is different about academic centers here is that we conduct clinical trials and often we have access to the next-generation therapies, but these are still considered experimental and something that should be done only in the context of clinical trials. So, Dr. Balar, do you have any key takeaways to share with our audience today? 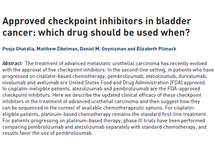 What we can safely say is that checkpoint blockade has a firm, established role in the treatment of advanced bladder cancer, but what remains unknown is what is the ideal sequence. Should you get it first-line or second-line? I think some of the trials that are ongoing will address that. But even then looking further in the future, given the activity that we are seeing in terms of novel combinations and also, for instance, other checkpoint inhibitors or in chemotherapy, I can say that in the future we will not see much single-agent use, but we will certainly see more combination use in the right partner. And what is the right way to approach this therapy is a little bit unanswered, and hopefully our trials will answer those questions. I see a future where platinum-based chemotherapy plus IO could be a new standard of care, and we have 2 large randomized trials that may support that. CTLA-4 plus PD-1 combinations may also lead to higher response rates. We saw this in melanoma. We also saw this in lung cancer. I think many of us expect that we will see similar outcomes in advanced bladder cancer. However, the population that should get it is a little bit unknown. Perhaps the PD-L1 negative patients where single-agent responses are low they may warrant the added toxicity risk of adding CTLA-4 blockade, and we’ve seen some hints of that in the durvalumab and tremelimumab experience. Other future combinations are a little bit more speculative. There has been a lot of controversy about the role of IDO1 inhibition based on the negative data from the melanoma trial. However, there may be some issues specific to melanoma as well as the drug that may still warrant further testing, perhaps, in other studies and other disease states before we know for sure if IDO inhibition is still a therapeutic avenue in bladder cancer. VEGFR combinations are something that I did not discuss, but these are also something that are really exciting and to look forward to. We have seen combination studies, VEGFR-based therapy in combination with immunotherapy in advanced kidney cancer showing high response rates. We hope that we will see similar outcomes in advanced bladder cancer, but those studies are currently ongoing. Well, this has been a great look into the new immunotherapy agents available for advanced and metastatic urothelial cancer. I’d like to thank my guest for being here today. Dr. Balar, it was great having you with us today. My pleasure, thanks so much. The preceding CME activity was sponsored by the University of Cincinnati and CORE Medical Education. You can access additional resources at ReachMD.com/CME. Don’t forget to take the posttest and evaluation to receive your free CME credit. 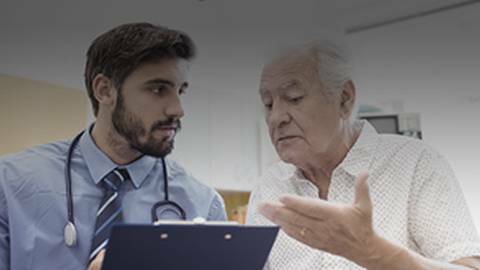 Learn more about the new immunotherapy agents available for advanced and metastatic urothelial cancer. Investigate novel immunotherapy options under development and its implications. 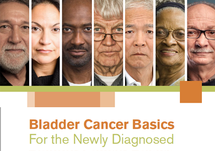 The intended audiences for this activity are physicians and other health care professionals who manage patients with advanced urothelial cancer. According to the disclosure policy of the University of Cincinnati College of Medicine, faculty, editors, managers, and other individuals who are in a position to control content are required to disclose any relevant financial relationships with the commercial companies related to this activity. All relevant relationships that are identified are reviewed for potential conflicts of interest. If a conflict of interest is identified, it is the responsibility of the University of Cincinnati College of Medicine to initiate a mechanism to resolve the conflict(s). The existence of these interests or relationships is not viewed as implying bias or decreasing the value of the presentation. All educational materials are reviewed for fair balance, scientific objectivity of studies reported, and levels of evidence. He served as an advisory board member for AstraZeneca, Genentech and Merck. He also served as a consultant for Incyte, Merck and Pfizer and a speaker for Merck, AstraZeneca, Genentech and Pfizer. John J. Russell, MD (host) has disclosed the following relevant financial relationships. He served as a speaker and advisory board member for Sanofi. Susan Tyler, MEd, CMP, CHCP, CME Director, has nothing to disclose. Bruce Gebhardt, MD, CME Reviewer, has nothing to disclose. Jennifer Holzberger, Program Coordinator, has nothing to disclose. Otto Ratz, MD, has nothing to disclose. Christina Culbert, MSc, has nothing to disclose. This CME activity has been planned and implemented in accordance with the accreditation requirements and policies of the Accreditation Council for Continuing Medical Education (ACCME) through the joint providership of the University of Cincinnati and CORE Medical Education, LLC. University of Cincinnati is accredited by the ACCME to provide continuing medical education for physicians. University of Cincinnati designates this enduring material for a maximum of .5 AMA PRA Category 1 Credits™. Physicians should claim only the credit commensurate with the extent of their participation in the activity. This CME activity was developed through the joint providership of the University of Cincinnati and CORE Medical Education, LLC. This CME activity is supported by an educational grant from Merck & Co., Inc. and AstraZeneca. This educational activity may contain discussion of published and/or investigational uses of agents that are not indicated by the FDA. Neither the University of Cincinnati College of Medicine nor CORE Medical Education, LLC, recommends the use of any agent outside of the labeled indications. The opinions expressed in the educational activity are those of the faculty and do not necessarily represent the views of the University of Cincinnati College of Medicine or CORE Medical Education, LLC. Please refer to the official prescribing information for each product for discussion of approved indications, contraindications, and warnings. 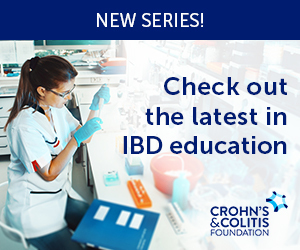 There are no fees for participating in and receiving CME credit for this online activity. During the period of September 25, 2018 to September 24, 2019, participants must 1) read the CME information, including the learning objectives and faculty disclosures; 2) listen to the full content of the activity and reflect upon its teachings; 3) successfully complete the post-test with a passing score of 70% and the evaluation at the end of the activity. The views and opinions expressed in this educational activity are those of the faculty and do not necessarily represent the views of ReachMD. This presentation is not intended to define an exclusive course of patient management; the participant should use his/her clinical judgment, knowledge, experience and diagnostic skills in applying or adopting for professional use any of the information provided herein. Any procedures, medications, or other courses of diagnosis or treatment discussed or suggested in this activity should not be used by clinicians without evaluation of their patients' conditions and possible contraindications or dangers in use, review of any applicable manufacturer's product information, and comparison with recommendations of other authorities. Links to other sites may be provided as additional sources of information. Once you elect to link to a site outside of ReachMD you are subject to the terms and conditions of use, including copyright and licensing restriction, of that site. Please also see Related Materials for additional information. Approved checkpoint inhibitors in bladder cancer: which drug should be used when?